I was recently invited to guest blog on Craftsy.com, a DIY educational site covering everything from quilting to cake decorating to woodworking. Despite being the stodgy traditionalist/suspicious New Englander that I am, I decided to give it a go. I’ll put something up about once a month or so and I’ll make sure to let you all know here when each Craftsy post is published. "Why aren’t people flocking to wooden bodied planes like they do to old Stanleys? Is it because they are too crude to do fine work? Are they too tricky to use? Are they simply antiquated technology left in the dust of their metal bodied counterparts? Are these things even worth messing with?" Check out the post and let me know what you think. Do any of you guys use wooden hand planes in your work? Do have any arguments for or against to add to my post? In this series I plan to cover restoring old ones, adjusting the cutting action, and more. Stay tuned. As one of the last years of highschool "Shop" courses in the early 80's , we were never, ever, introduced to hand tools. 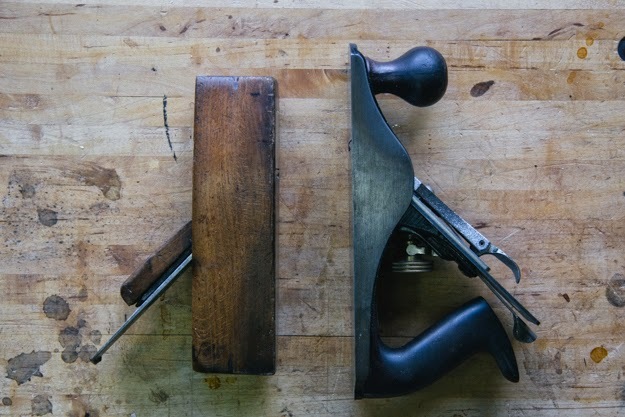 It was only in the last 15 years that I actually picked up a handplane (Stanley handyman #4) and learned--via the internet, how to use it. Wood bodied handplanes are very far and few In between the fleas, garage sales and estate sales. One, and only one, simple reason. I.M.H.O. I've got better odds of lining up all the noodles end-to-end in a bowl of noodle soup than I have of setting an iron the to proper depth, which is probably just as time consuming and frustrating as the noodle exercise. Sorry to hear you've struggled with them. Hang tight. I plan to post about adjusting them in this series. Thanks for your input! I just finished reading your article on the benefits of using wooden hand planes and I enjoyed it very much. Although I have both metal and wooden planes in my shop, I have yet to begin using the wooden ones very much at all. Your brief commendation has rekindles my interest in the wooden planes. Thank you for sharing that article with us. God bless. I recently cleaned up a wooden smoother that my Grandpa made during his apprenticeship (in the 1920s, I think). I'd love to use it but I can't seem to get it to take a shaving without jamming. Thanks for the blog. It's great to see someone sharing their faith along with their work! I use a wooden smoother while at sea. As it is now it is the only time I ever get around to do some "real" woodworking. At home it is all more or less maintenance of the house right now. I also have a blade for the same body that is ground as a scrub plane. At home I have a dedicated scrub plane, It is an old fore plane that I have ground the blade on. Sometimes I use a wooden jointer as well. The best feature in my opinion is the low friction, and also that they don't rust like metal bodied planes do. That can be a challenge depending on the area where you live. Being "forced" to only having one plane on board with me, has made me become so much more familiar with the plane than I am with any of my metal bodied planes. I can insert the smoothing iron and eyeball the setting, insert the wedge and take a test shaving, give it a few taps to make the final adjustment and be planing within a minute. I can easily get thin shavings that will allow me to read a newspaper through. (I have once seen that mentioned as a thing to strive for when smoothing).